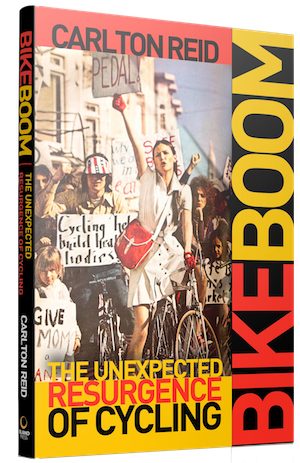 Bike Boom was published in June 2017 by Island Press of Washington, DC. The 800+ footnotes for the book are free to read online. Buy the print book from Amazon.com, Amazon.co.uk, Barnes&Noble, or indie book sellers. Digital versions of the book are available on Amazon and Apple’s Book Store. The iPad version of the book (with additional illustrations and videos and audio files) will be available from Apple’s Book Store soon. Got the book? Submit a review to Amazon and to Goodreads.com. A historian has used the spin-off from an American military mapping project to discover nearly 300 miles of “lost” British cycleways. These cycleways were installed beside British roads between 1934 and 1940, but were abandoned after the Second World War. Many were surfaced with red concrete, protected cyclists with kerbs and extended for many miles. They were commissioned by the Ministry of Transport and were built on both sides of the arterial roads constructed in the 1930s. 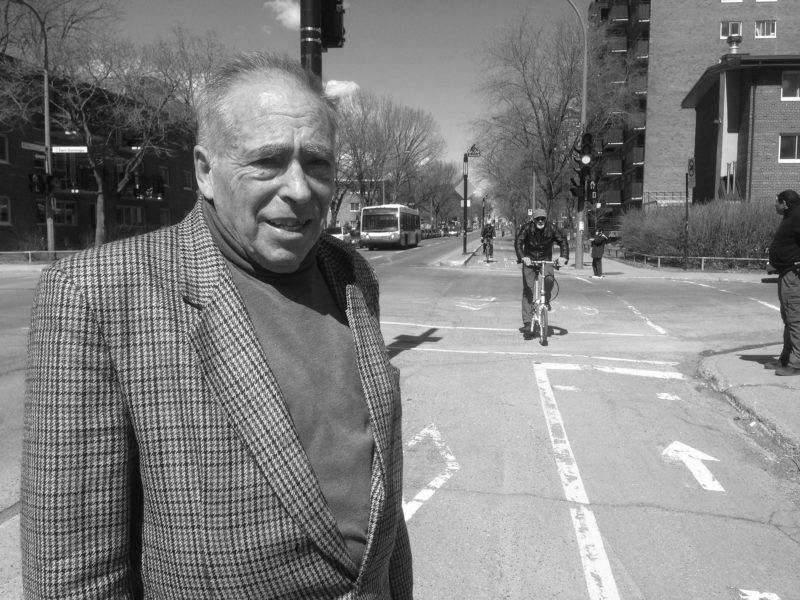 Author and historian Carlton Reid used archive sources to identify the likely locations for the cycleways, and then confirmed their existence not with field walks or even bike rides, but with Google Streetview. “From the comfort of my desk I’ve been able to back-up my hunches by zooming in to the images provided by the Streetview cameras,” said Reid, who is funding further researches with a crowd-funding campaign. “Some of the 1930s-era cycleways I’ve identified are either fully or partially buried, but most are above ground, in full view but they are not recognised for what they are, which is innovative-for-the-time cycle-specific infrastructure that’s more than 80-years-old,” said Reid. “The cycleways have been wide and often kerb-protected since they were built, but it was quickly forgotten when and who they were built for,” he added. Google Streetview is an off-shoot from Google Earth, the descendant of EarthViewer, a CIA-funded project that was used by the US military in war zones from the late 1990s onwards. Google acquired EarthViewer in 2004 and rebranded it as Google Earth in 2005. Archeologists often use Google Earth – and other open-access satellite-imagery services – to find hidden hill-forts and even buried treasure, but this is the first time the satellite and street-level imagery has been used to discover hidden-in-plain-sight 1930s-era cycleways. Reid has partnered with an urban planner to bring back to life perhaps hundreds of miles of these forgotten cycleways. John Dales of Urban Movement will take Reid’s historical research and use it to show local and national authorities that there’s often plenty of space for cycling – because the space was allocated many years ago. Cycle advocacy organisations often campaign for Dutch-style cycleways and what Reid’s project is showing is that the British Ministry of Transport worked with its Dutch equivalent in the 1930s to create just such a Dutch-style system. Reid discovered the extent of the 1930s-era cycleway network during the research for a cycle history book to be published next month. “Bike Boom” (Island Press, Washington, DC, June 2017) contains information on the 1930s-era cycleways with the Kickstarter campaign enabling him to continue his research work. Some of the cycleways Reid has digitally uncovered extend for a few miles either side of the suburban arterial roads built in the 1930s, but he has also identified residential cycleways (they are often now treated as “private roads” with cars parked on them). 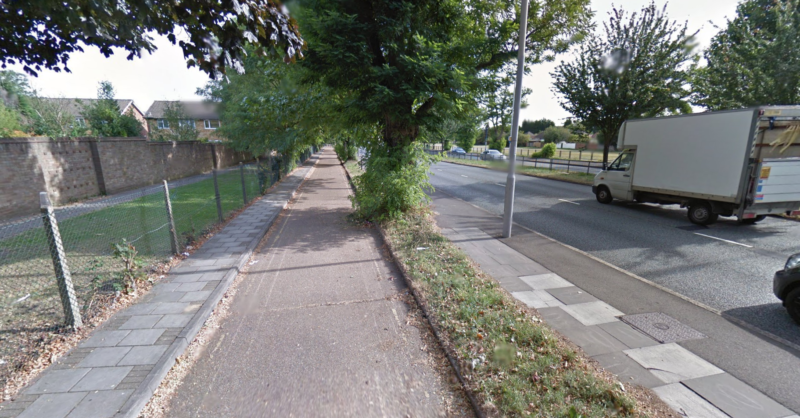 Archive maps show that the 18-mile Southend Arterial Road from Gallows Corner in Romford to Southend once had cycleways along its full length (they were known as “cycle tracks” at the time) and this cycleway linked in to others in the area. “Let’s rescue Britain’s forgotten 1930s protected cycleways” was launched on Kickstarter on 25th April and exceeded its £7,000 target within three days. 356 backers have so far pledged £10,227. The campaign ends on 25th May. Backers get behind-the-scenes access to reports that will be provided to local authorities, Highways England and the Department for Transport. Reid is the Newcastle-based executive editor of trade magazine BikeBiz.com and author of “Roads Were Not Built for Cars” (Island Press, Washington, DC, 2015). The front cover of Bike Boom can be seen above, but here’s the back cover, too. It contains the all-important blurbs. Text too small to read? Click for a larger version or read the full text is below. The book majors on the bike booms of the 1930s in the UK and the 1970s in the USA. Between 1934 and 1939 Britain’s Ministry of Transport paid local authorities to install cycle tracks. Seventy or so schemes were built, resulting in perhaps as many as 280 miles of cycle tracks, some of them protected with curbs. The great majority were built – 9-ft wide and both sides of the roads – next to the new bypasses of the era; a few were built on “trunk roads” through residential areas, such as in Sunderland and Oxford. The Kickstarter for this project is now LIVE. 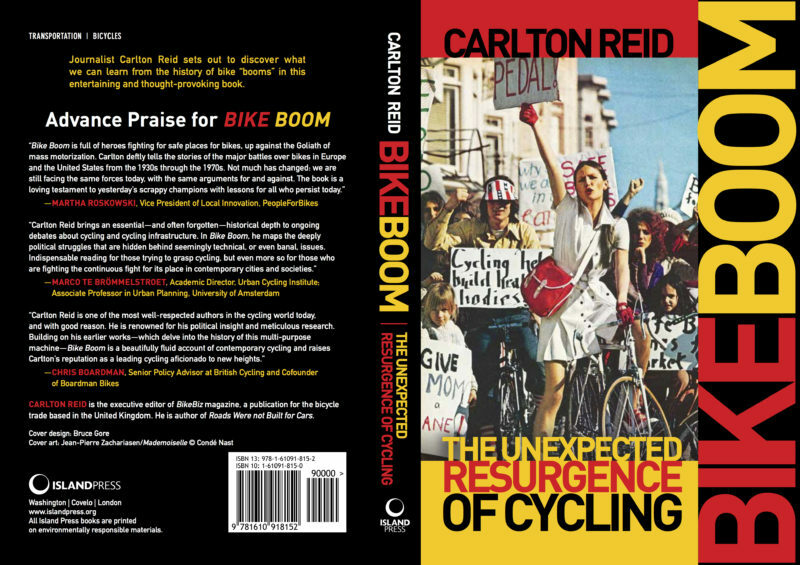 Journalist Carlton Reid sets out to discover what we can learn from the history of bike “booms” in this entertaining and thought-provoking book. CARLTON REID is the executive editor of BikeBiz magazine, a publication for the bicycle trade based in the UK. He is author of Roads Were Not Built for Cars. Bike Boom will be available in June from Island Press, Washington, DC. The index and 800+ footnotes for the book are already online. Riding a bicycle is life-affirming, but I never thought writing a history book about cycling could have the sort of impact I’m about to relate. Montreal in Quebec, Canada, was a hot-bed of cycle advocacy in the 1970s and 1980s, one of the key reasons that city now has hundreds of miles of cycleways, including a two-mile curb-protected cycleway smack-bang in the Central Business District. Montreal became bicycle-friendly because of people power. Bicycle-advocacy group Le Monde à Bicyclette was founded in April 1975, and many of the campaign tactics it employed – such as die-ins – are still used by advocacy groups around the world. The anti-automobile activism group was cofounded by Claire Morissette and Robert “Bicycle Bob” Silverman. The curb-protected cycleway in the Central Business District was built in 2007, replaced a car lane, and was named for Morissette, who had died from cancer earlier in the same year. For Robert “Bicycle Bob” Silverman and all of the other 1970s cycle advocates who tended cycling’s flame when planners and politicians were trying to snuff it out. “Thank you for dedicating the book to me. Reading it actually saved my life. I’m going blind with macular degeneration which started a few years ago, which was combined in early October with a stroke. Life has been very hard; so bad that I cannot ride a bicycle any more, cook, or do other very simple tasks. I was prepared to take my own life, but changed my idea after reading your dedication. “This is true, not an exaggeration. In Quebec, dying with dignity is legal … But since receiving your dedication [my mind has] changed. I was very touched by Robert’s candour, and asked his permission to tell this particularly sensitive tale. 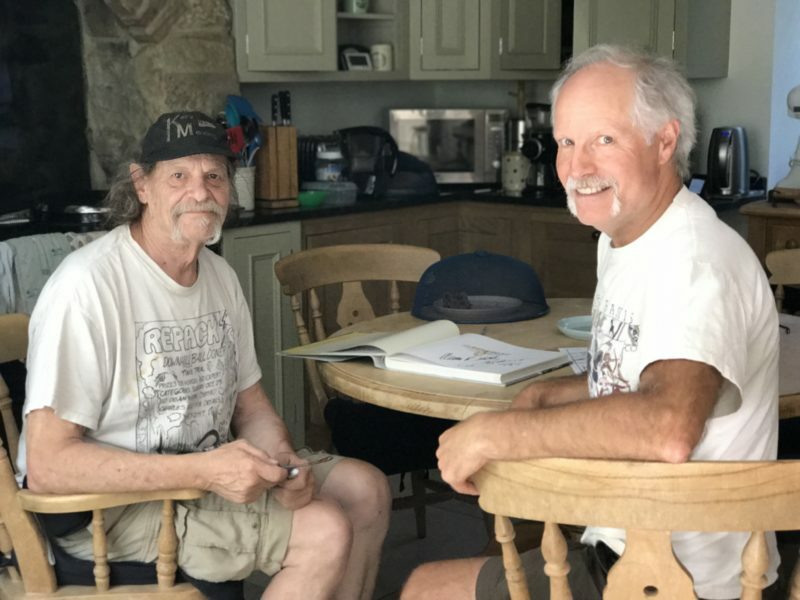 Wonderfully, Robert is now working with local advocates to produce an in-depth history of Le Monde à Bicyclette and will also be dictating a number of hard-hitting bicycle blog-postings. Bike power! * #1 on iTunes (history category). #1 on Amazon.com Kindle store (automotive category).